Winter is coming. Not a perpetually incoming winter ala Game of Thrones (will it finally arrive in Season 7????) – but you know, actual winter. Which generally means a mini-shopping spree for me, stocking up on games to pass the time while being shacked up inside for the next few months. Let’s see what’s incoming. Next month sees the release of the latest movie in the Planet of the Apes franchise – War for the Planet of the Apes – so there’s no better time to announce that a miniatures board game of this classic movie series is in production, and will be hitting Kickstarter next year from WYSIWIGames. Don’t confuse this with IDW’s co-op Planet of the Apes game – which is based on the original movies from the 60s / 70, and will be releasing later this year. We don’t have more information right now, but you can sign up for any news. Where the streets have no name…. that you can mention safely, lest it lead you down the path to madness. 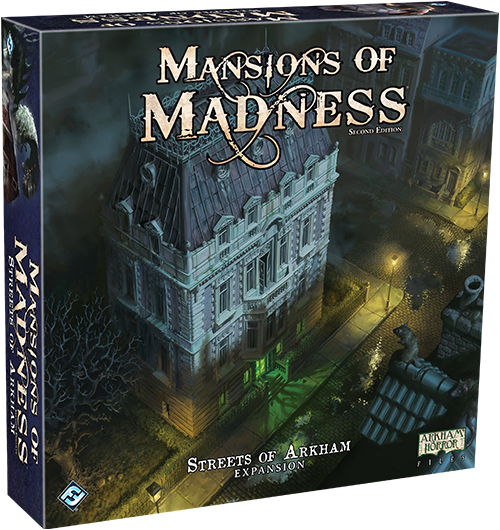 Fantasy Flight has announced its latest expansion for Mansions of Madness: Second Edition titled Streets of Arkham. Releasing from Wizkids later this year, is the latest D&D title in their popular co-op Adventure System series – Tomb of Annihilation. This means that it’s compatible with any of the other games in the series, like The Legend of Drizzt or Castle Ravenloft. Tomb of Annihilation releases in two different flavours – the single-colour-miniatures “standard” edition, and the fully-painted minis “premium” version. 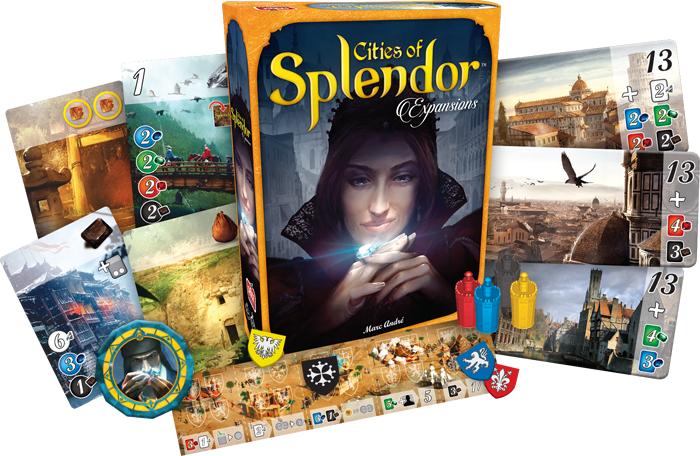 Possibly one of my favourite titles, or maybe just most-played, is Splendor. So I was pretty excited when Stuart sent me details of a likely release date for the game’s upcoming The Cities expansion – August 2017. The box actually consists of 4 different expansions, allowing you to alter the experience the main game in a number of ways. Compete to take over score-heavy cities with the The Cities add-on, establish sea routes and trading posts in India in the Trading Posts expansion. Choose from a whole new deck of development cards with The Orient expansion, and lastly, The Stronghold brings a level of interaction to the game with the new stronghold pieces – after purchasing a development card, a player can choose to place a stronghold on another card in play to effectively book / reserve the card, or use a stronghold to remove a rival’s stronghold from a card. Place 3 of your own strongholds on a single card, and it can be claimed by right of conquest. From the creators of Legend of the Five Rings, comes 7th Sea: War of the Cross, a diplomacy / strategy board game based on the classic “swashbuckling and sorcery” RPG setting. Funding is off to a good start, generating around $50K in 3 days – with a pledge goal of $150,000. Epoch: The Awakening is a intriguing new game from first-time designer Marc Neidlinger. Fantastic miniatures (and other components), amazing art – we’re looking forward to seeing how this turns out. EPOCH: The Awakening is a highly strategic tabletop board game for 2-5 players. The main mechanic is action selection with advanced resource management and an optional focus on area control. Game play generally takes 15-30 minutes per player. It has a careful balance of depth and tempo, which is a challenging combination. Playing it will give you joy. The game has yet to reach it’s funding goal, but with 20 days left, and only around $13K to go, it should cross the finish line easily (and reach some stretch goals). Get ready to rule the galaxy. Galactic Warlords: Battle for Dominion is a area-control title featuring card drafting. Conquer the galaxy and become the most powerful warlord in this 2-4 player card-driven game of tactical deployment and planet control by Babis Giannios, with fantastic art and miniatures from The Mico and Francesco Orru! With 17 days to go, the game’s funding goal of 33K Australian Dollars is 2/3 funded. Next week Paul is dropping his review of one of the most-hyped releases over the last year…. Cry Havoc.